by Marcia Hill Gossard ’99, ’04 Ph.D. | Photo by Henry Moore, Jr. In a large room filled with a half dozen tables, groups of students are following what might appear to be sewing instructions with stich names such as “cruciate” and “simple interrupted.” At the top of the sheet it reads: Practice Made Perfect. For the WSU veterinary students who are actually learning basic surgical suturing skills, this kind of practice gives them the confidence they need to perform surgeries later in the program. Three years ago, Dr. Julie Cary and her colleagues began offering open labs to hone surgical skills in a simulated environment to better prepare WSU veterinary students for the job market. What they found was that students felt more comfortable experimenting with different surgical techniques when they worked with other students. “Student were more likely to try new techniques with their peers, rather than with professors,” says Cary, a clinical associate professor. So using a peer teaching model, she started training second and third year veterinary students to work as teaching assistants in the labs. —Amy Berry (’15 DVM) from Wyoming, who is a teaching assistant in the lab. She wants to practice agricultural animal and equine medicine in rural America. The labs were so popular that after a few years they realized that they needed their own space. In September 2013, with the support of students, the college, and some generous donations, they were able to renovate several rooms in McCoy Hall, the site of the college’s original teaching hospital. The students have been instrumental in creating an environment that feels comfortable to them, says Cary. Students can ask the teaching assistants questions, and Dr. Cary is nearby if students need additional assistance. “It is a great opportunity for students to become teachers and really master the skills,” says Micall Godderidge (’15 DVM) from Utah, who plans to work in a large animal private practice. The peer-teaching model has helped to create a student culture where it is the norm to help one another. The peer-based format also has a low-stress, non-intimidating environment, says Godderidge. Now officially named the Clinical Simulation Center, the goal over the next three years is to expand the center to offer more high fidelity simulation models. 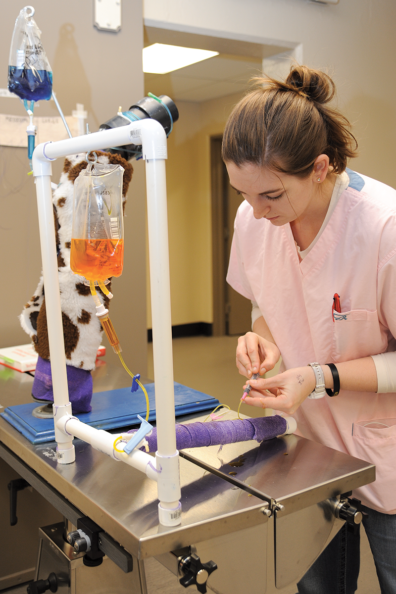 High fidelity models provide the physical, or haptic, feedback that a veterinarian would feel during an actual exam or surgical procedure. The center plans to add a Calgary Horse, haptic cow, and haptic horse. Renovations in phase two will also include a simulated operating room (to be completed in August 2014). The remodeled space will provide students with the opportunity to practice their skills in a more realistic setting. 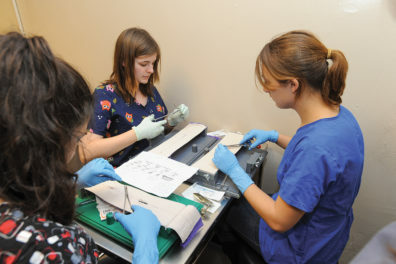 During critical care simulation, students will work though a problem as a team. They will practice the technical aspects of a medical issue, such as cardiac arrest, but they will also get to experience team dynamics, which can affect patient outcomes. While these types of simulations have frequently been done in human medicine, they have been less common in veterinary medicine. One of the most important benefits of this kind of training is that it helps to prevent medical errors. In the final phase of development, Dr. Cary hopes to construct a debriefing room for small group teaching and to discuss what may have gone wrong in the simulation and what they could do better next time. The labs are currently open to WSU veterinary students, interns, and residents. In the next five years, the goal is to expand educational opportunities to veterinary staff and practitioners. Learn more about the WSU Clinical Simulation Center and how you can help our veterinary students. 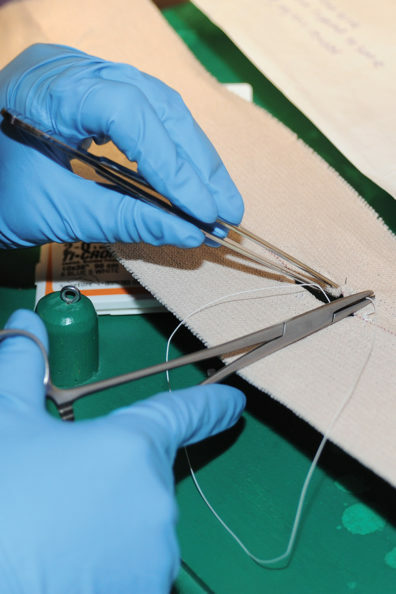 The peer-based approach offers a stimulating learning environment where students feel comfortable experimenting with different surgical techniques. Because students have the opportunity to practice basic technical skills early in the curriculum, they are ready to learn more advanced skills and concepts later in the program. Practice helps give students more confidence to do their first surgeries and to do the work they need to do when they graduate. « From the Office of Development and Alumni Relations: More than a Machine.